Spread the word! Invite your colleagues and peers to join you at AFCC 2018 by using AFCC 2018 promotional toolkit. Use our Tell A Colleague online form on top of this page to invite your friends and colleagues to join you at AFCC 2018. Use these banners to promote AFCC 2018 your website, intranet or event calendar. Sign up here for our e-blasts to receive timely news and information on AFCC 2018. 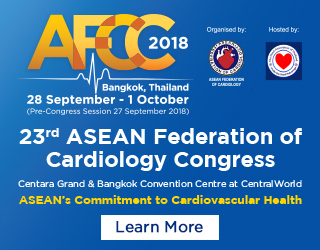 The 23rd ASEAN Federation of Cardiology Congress (AFCC 2018), coming to Bangkok on 27th September – 1st October 2018, will bring all delegates from around the world together with the aim of sharing the the year’s advances in basic science, research & clinical practice in the field of cardiology. The Scientific Committee is organizing a comprehensive program of plenary lectures, lunch symposia, interactive sessions and workshops that will continue to evolve and improve along with the stellar lineup of regional and international experts who will be leading them. At the same time, a gala social program will provide ample opportunities for catching up with friends and associates, meeting new ones, and getting a taste of the hospitality and cultural diversity of vibrant Bangkok. Mark your calendar and join us in Bangkok! Visit www.afccbkk2018.com for more information. Use AFCC 2018 promotional slides at the end of your presentations at appropriate meetings and show on screens at events between presentations. You can also download our letterhead template to invite your peers to attend to the event.